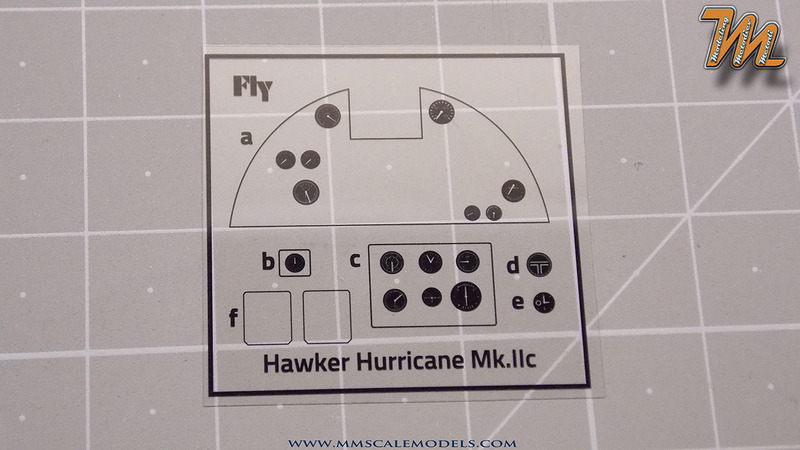 The Hawker Hurricane plastic scale model kits line up from Fly models is something that got a lot of modelers excited. It is a truly remarkable package. 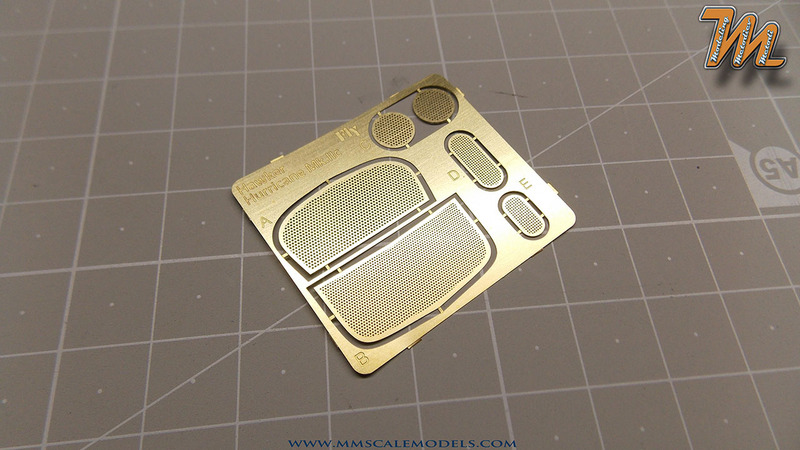 Large scale, photoetched and resin parts, nicely detailed plastic. 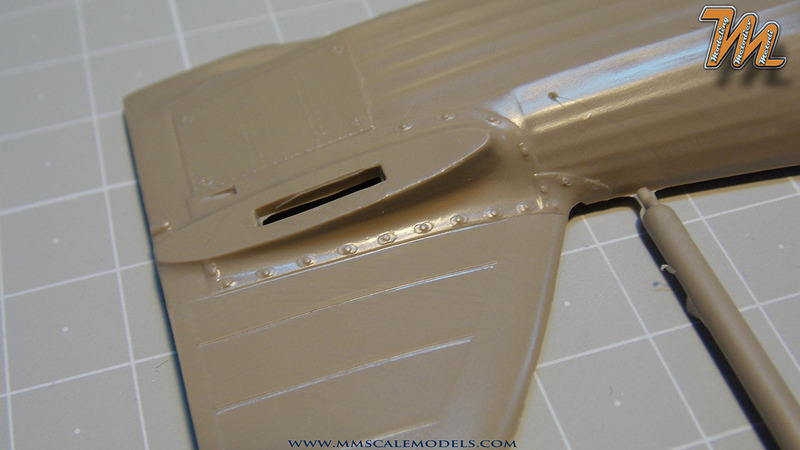 In this article you will see how things look inside that big box with Hawker Hurricane drawn on its top. The Hawker Hurricane is a British single-seat fighter aircraft that was designed and predominantly built by Hawker Aircraft Ltd for the Royal Air Force (RAF). Although overshadowed by the Supermarine Spitfire, the aircraft became renowned during the Battle of Britain, accounting for 60% of the RAF's air victories in the battle, and served in all the major theatres of the Second World War. The 1930s design evolved through several versions and adaptations, resulting in a series of aircraft which acted as fighters, bomber-interceptors, fighter-bombers (also called "Hurribombers") and ground support aircraft. Further versions known as the Sea Hurricane had modifications which enabled operation from ships. Some were converted as catapult-launched convoy escorts, known as "Hurricats". More than 14,583 Hurricanes were built by the end of 1944 (including at least 800 converted to Sea Hurricanes and some 1,400 built in Canada by Canadian Car and Foundry). Though faster and more advanced than the RAF's current front line biplane fighters, the Hawker Hurricane's constructional design was already outdated when introduced. It used the traditional Hawker construction techniques, with a Warren truss box-girder primary fuselage structure with high-tensile steel longerons and duralumin cross-bracing using mechanically fastened rather than welded joints. Over this, wooden formers and stringers carried the doped linen covering. 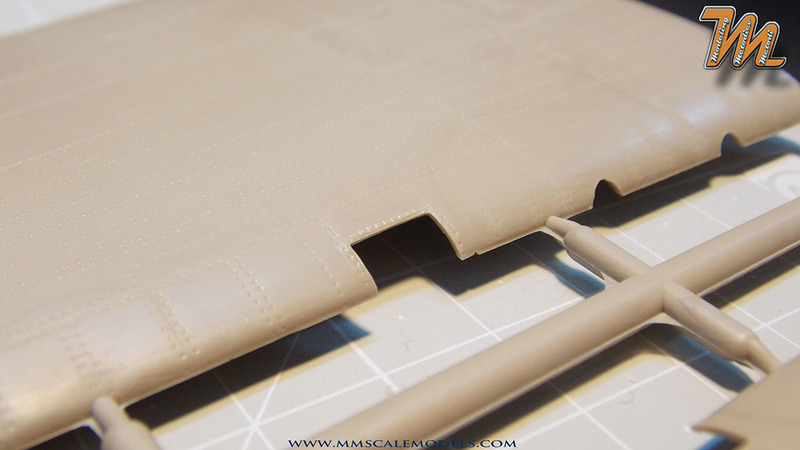 Initially, the wing structure consisted of two steel spars, and was also fabric-covered. An all-metal, stressed-skin wing of duraluminium (a DERD specification similar to AA2024) was introduced in April 1939 and was used for all of the later marks. 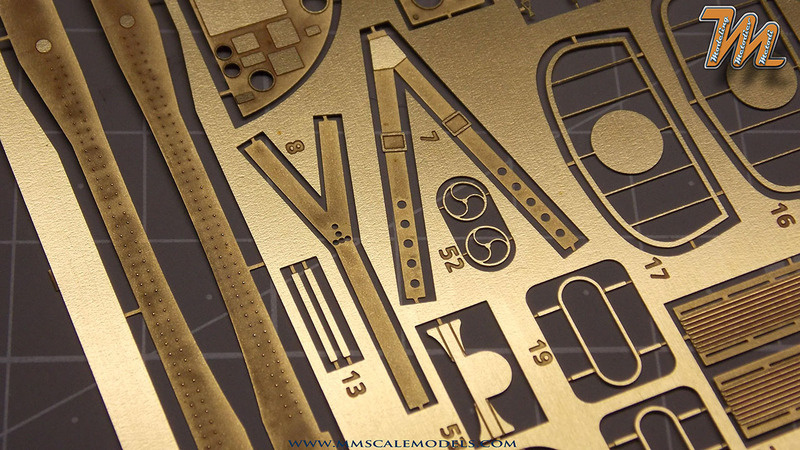 "The metal skinned wings allowed a diving speed that was 80 mph (130 km/h) higher than the fabric-covered ones. They were very different in construction but were interchangeable with the fabric-covered wings; one trials Hurricane, L1877, was even flown with a fabric-covered port wing and metal-covered starboard wing. 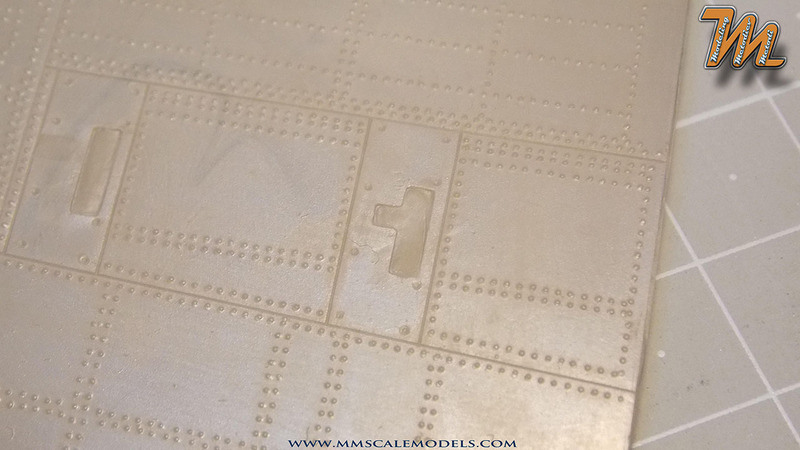 The great advantage of the metal-covered wings over the fabric ones was that the metal ones could carry far greater stress loads without needing so much structure beneath." Several fabric-wing Hurricanes were still in service during the Battle of Britain, although a good number had had their wings replaced during servicing or after repair. Changing the wings only required three hours work per aircraft. Hurricane Mk IIA Series 1 equipped with new and slightly longer propeller spinner and fully replaced the machine-gun armament with four 20 mm (.79 in) Hispano Mk II cannons, two per side. Hurricane IIA Series 2 became the Mk IIC in June 1941, using a slightly modified wing. 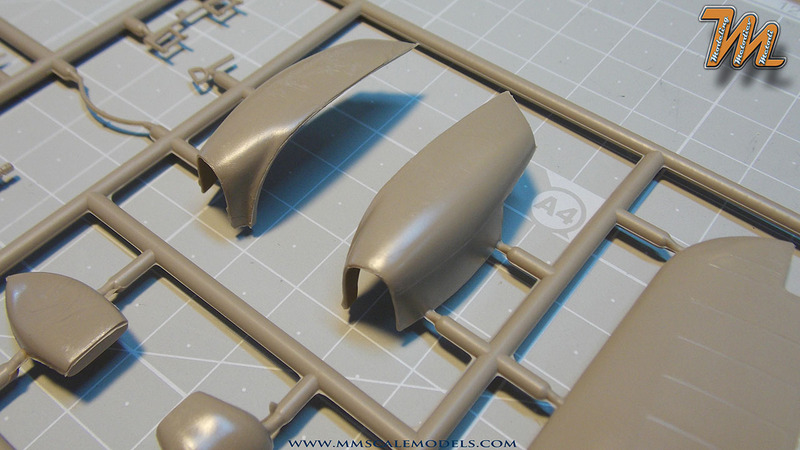 The new wings also included a hardpoint for a 500 or 250 lb (230 or 110 kg) bomb, and later in 1941, fuel tanks. By then performance was inferior to the latest German fighters, and the Hurricane changed to the ground-attack role, sometimes referred to as the Hurribomber. The mark also served as a night fighter and intruder. 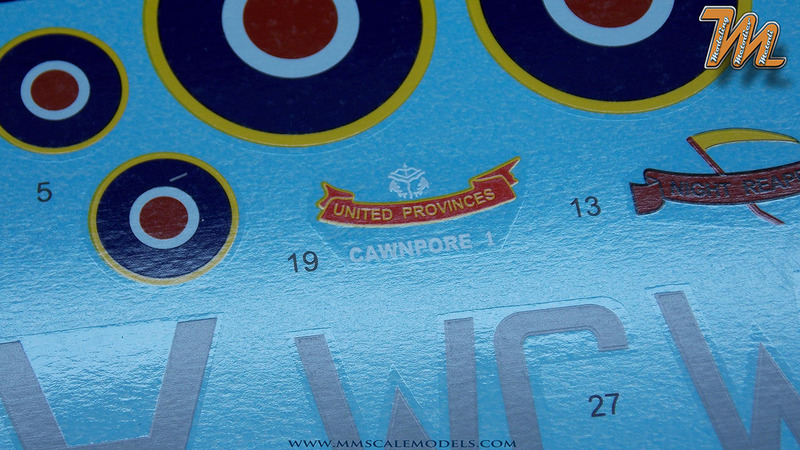 The Fly models, 1/32 Hawker Hurricane MkIIc kit (number fly32012) comes in large top opening box with beautiful painting boxart depicting aircraft from RAF No309 Polish Fighter-Reconnissance Squadron over the cliffs of Dover. 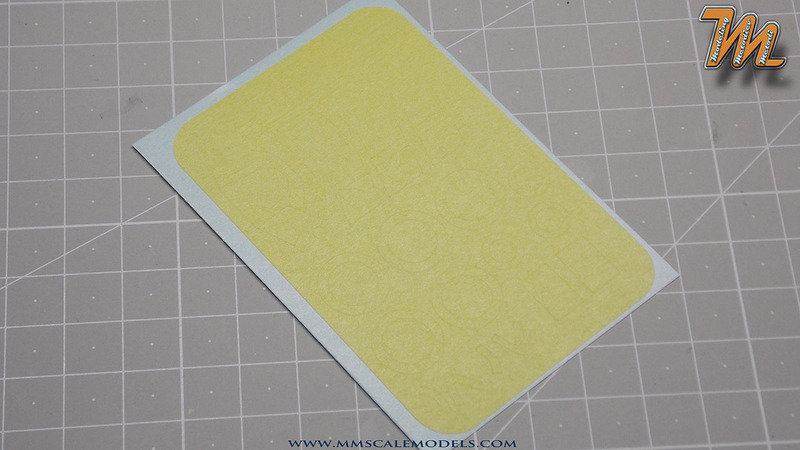 Inside there are four beige plastic sprues, packed in one bag; one transparent sprue; eight blocks with resin parts; two photo etched frets; acetate sheet; three decal sheets; full color, double sided camouflage schemes sheet; stencil positioning guide and a instructions booklet. The instructions come in A5 size booklet. They are printed in color on heavy and glossy paper. 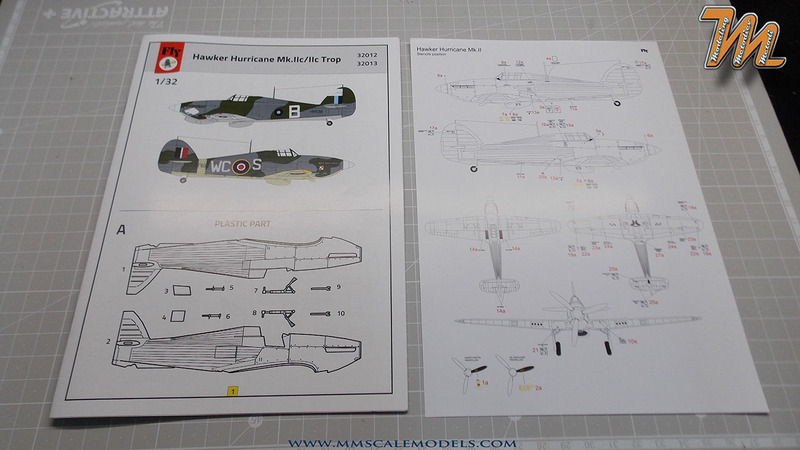 The same instructions are used in the 32013 kit, which can cause some confusion along the way. In the first four pages there is the parts breakdown. 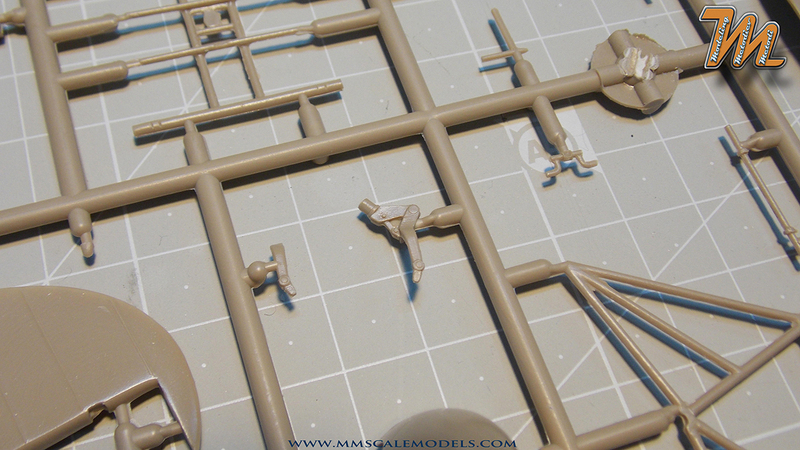 As there are no part numbers on the sprues, those first few pages are going to be used a lot. Unfortunately the assembly instructions are far from being good. 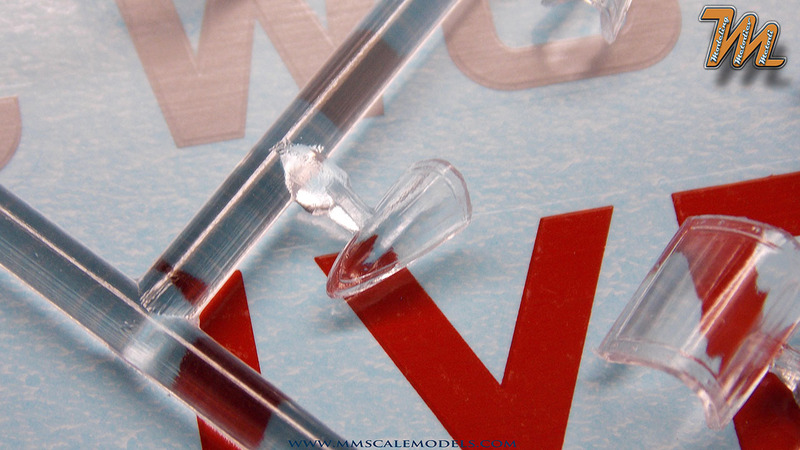 Although printed in color and they are a bit vague on parts placement, using arrows to point to ( in some cases ) general area. Also there are some succession issues. 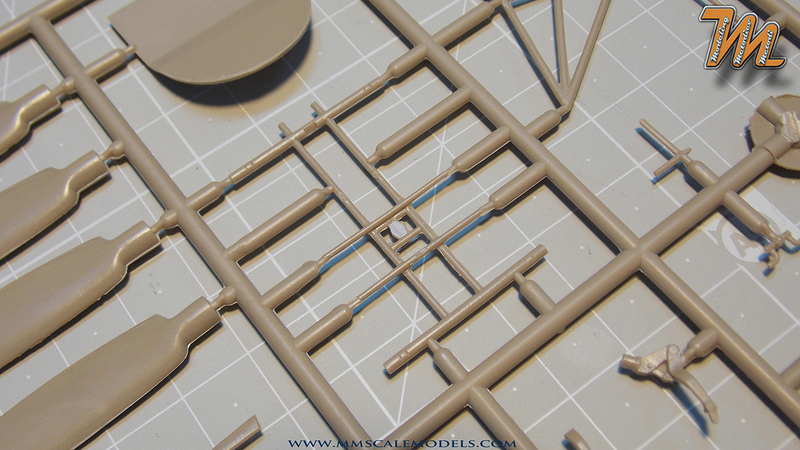 For instance, to install part D16 in step 5 you need to put it between parts C18 and D15, which you already glued together in step 2. 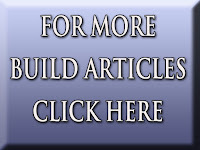 What is more there are optional items but on which version/scheme they go it is not stated. For instance the under chin air intakes, there are three options - one big and two smaller. While the bigger one is for the "Trop" version but which one of the smaller ones to use? Well from what I found after a quick picture comparison, the smaller seems to be the right one to use... but it would have been easier to just read it from the instructions. 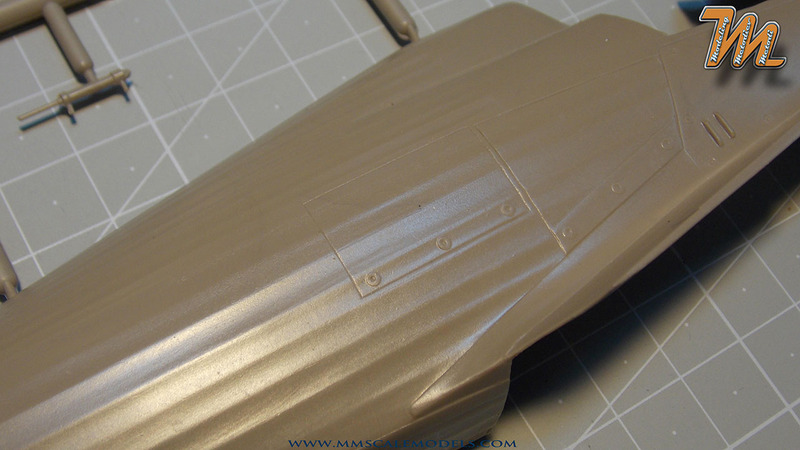 The last three pages of the instructions are a paint guide for various details such as the cockpit, wheel wells props and more. The stencil position instructions are on a separate A5 page. 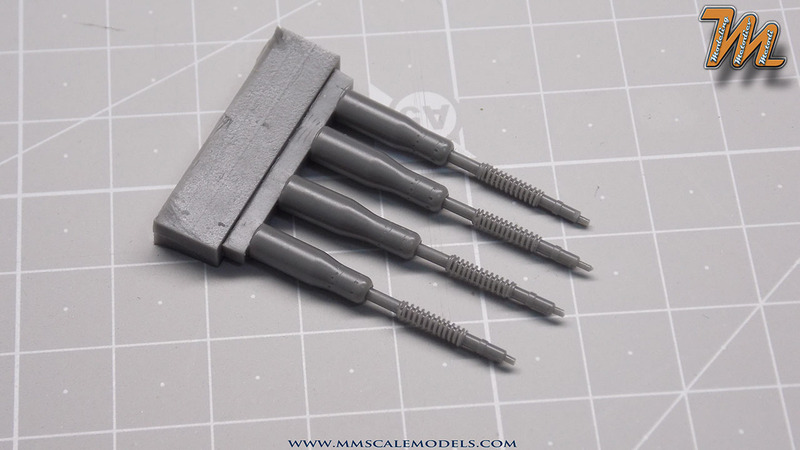 There are six marking options provided with the kit of which four are for night fighter version. 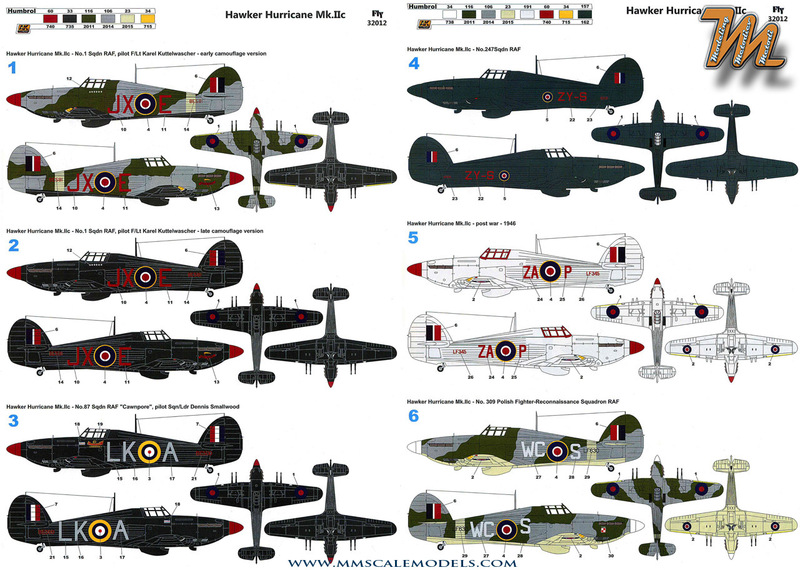 The camouflage schemes are provided in full color four-views on one A4 sheet. Paints are given in AK interactive and Humbrol ranges. 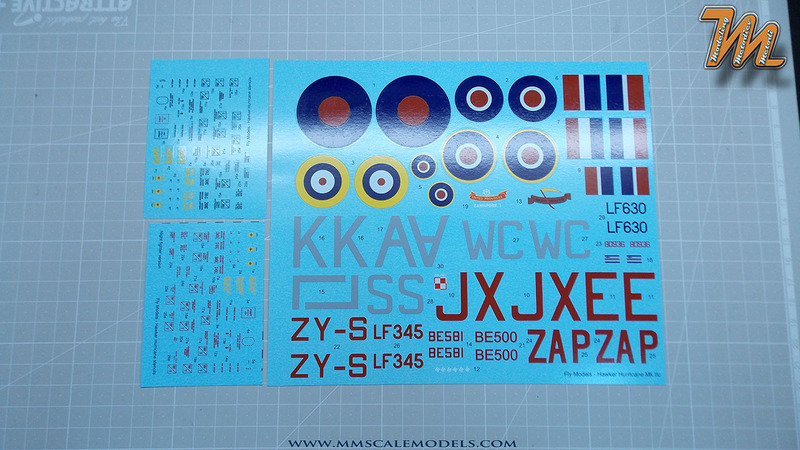 The decals are separated in three sheets, two of which are with service stencils (one for night fighter version and one for regular fighter). They are printed for Fly models by company called Bodecek Agency. Everything here looks right. Print is in register and colors are solid. The carrier film seems to be sufficiently thin but a bit too wide around the markings. 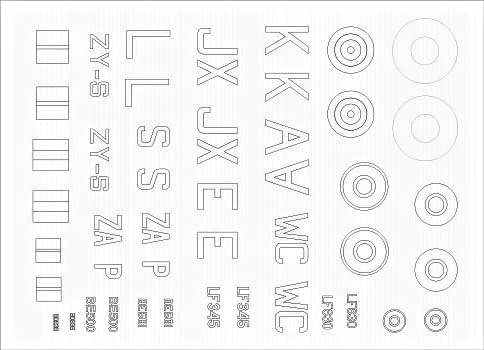 Small letters on stencils are perfectly readable even for the unarmed eye except the yellow ones but that's a matter of color... its just hard to read on light background. 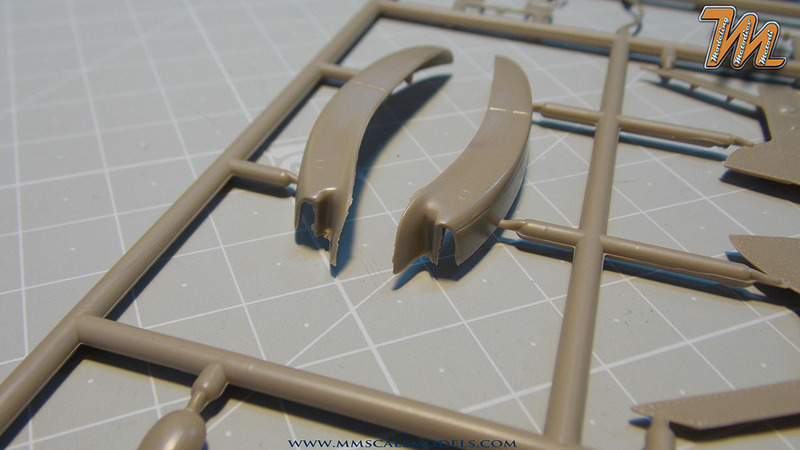 On sprue A there are the two fuselage halves, the gear legs and two supports, two hydraulic cylinders that go in the wheel well, escape hatch ( I haven't seen that hatch opened on pictures so why is it separate piece?) and the radiator outlet door. The fuselage halves represent the complete length of the airplane with the exception of the rudder and the spinner. The surface detail is very nice. 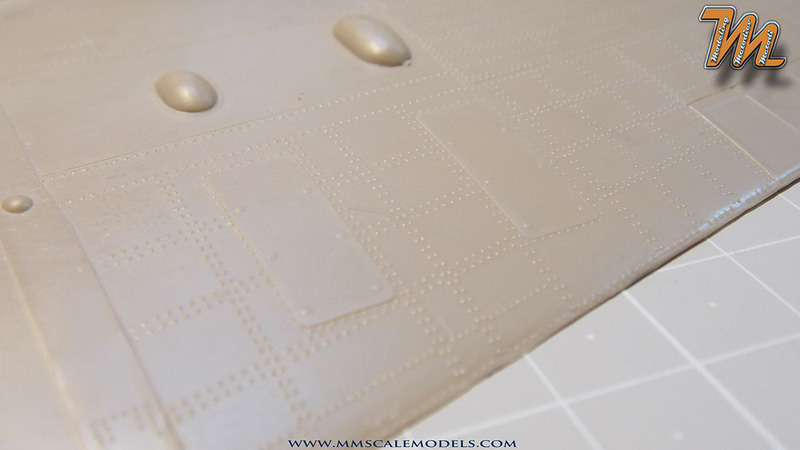 The fabric covered areas capture the appearance of the real aircraft pretty well. 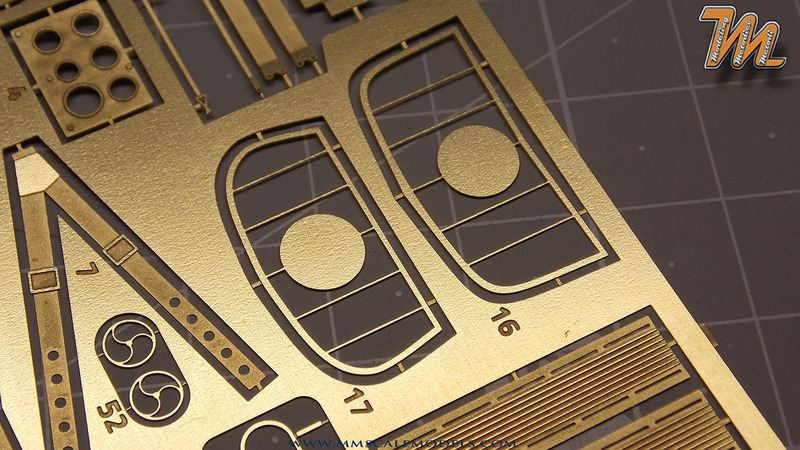 The metal panels have their different types of fasteners represented. 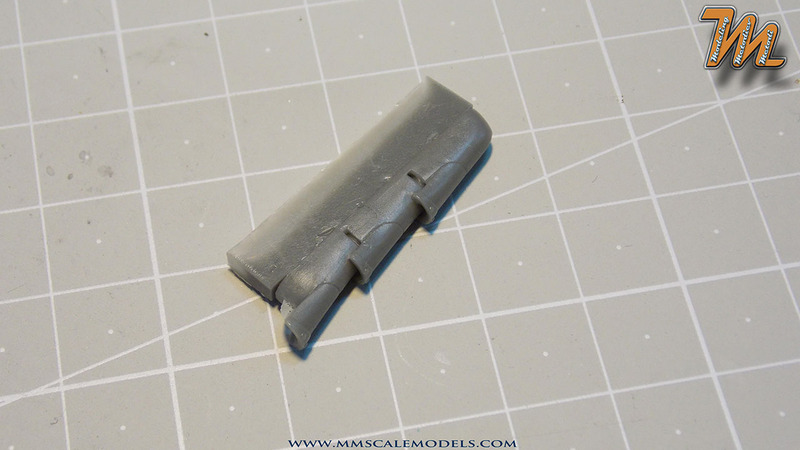 Most of the fasteners are crisp only those around the horizontal stabilizers are a bit softly molded. 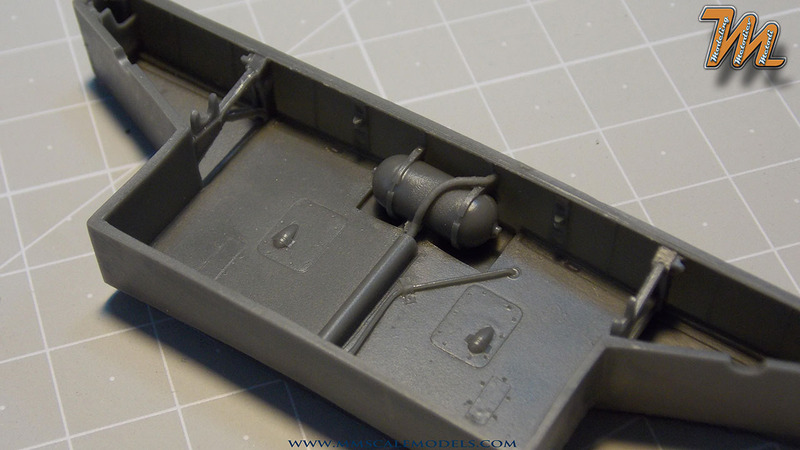 On the inside, the fuselage halves, have some structural detail. 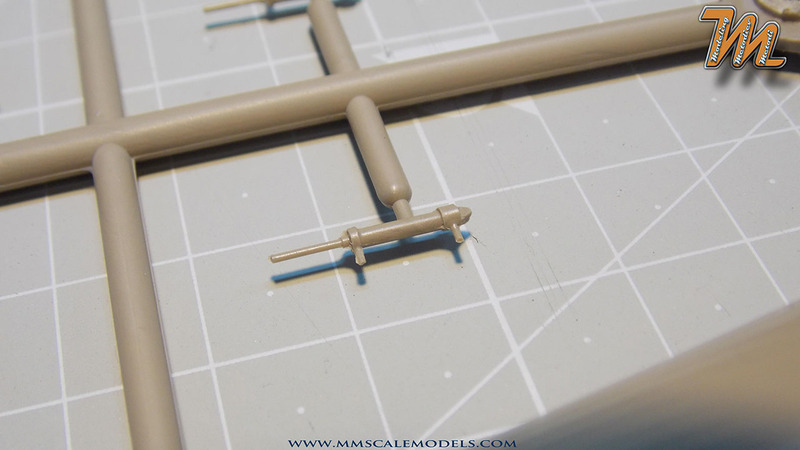 The gear legs appear to be sturdy enough to carry the weight of the airplane but are they really remains to be seen when I build this scale model. 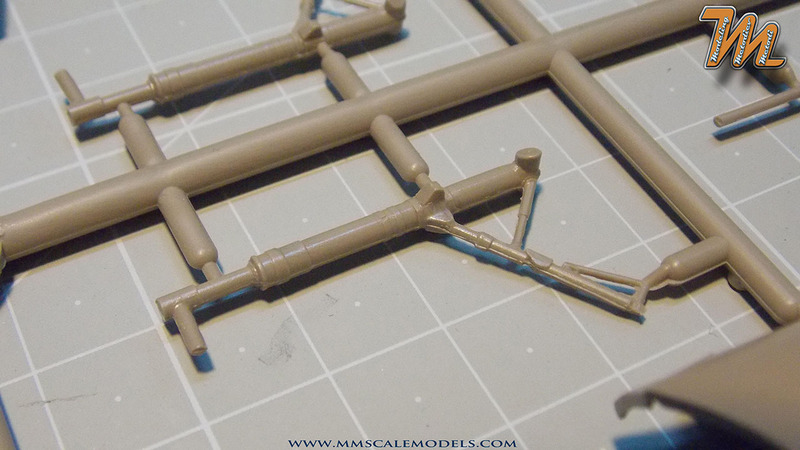 Detail wise they look OK but you'll have to add brake lines and remove the parting line. 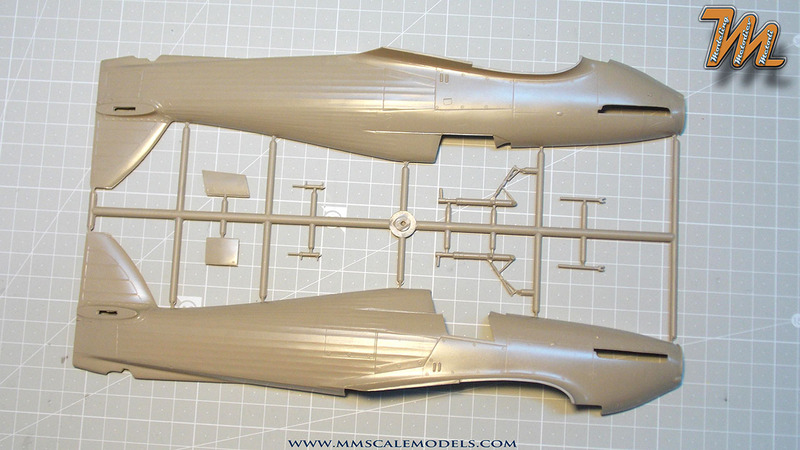 Here are the wings, separated in upper and lower halves. 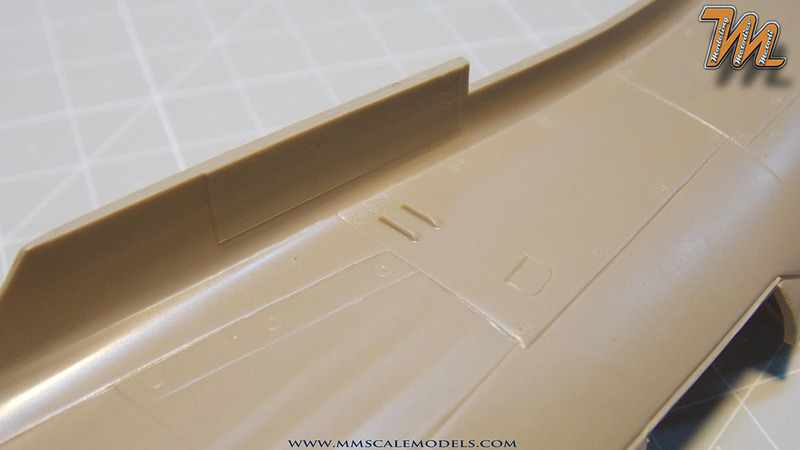 The wing surface detail is absolutely fabulous. 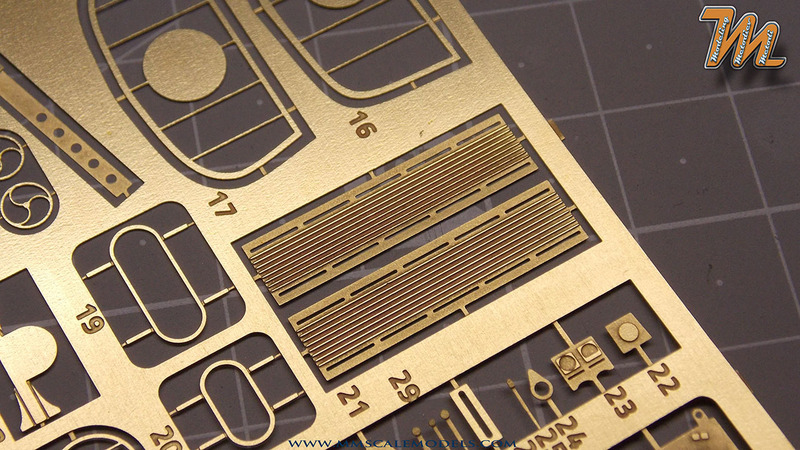 You get fine recessed panel lines, recessed rivets, raised rivets of different sizes, ribbing, reinforcement plates, bulges... I am not a Hawker Hurricane expert but I am confident that what is on the real thing it is also here. 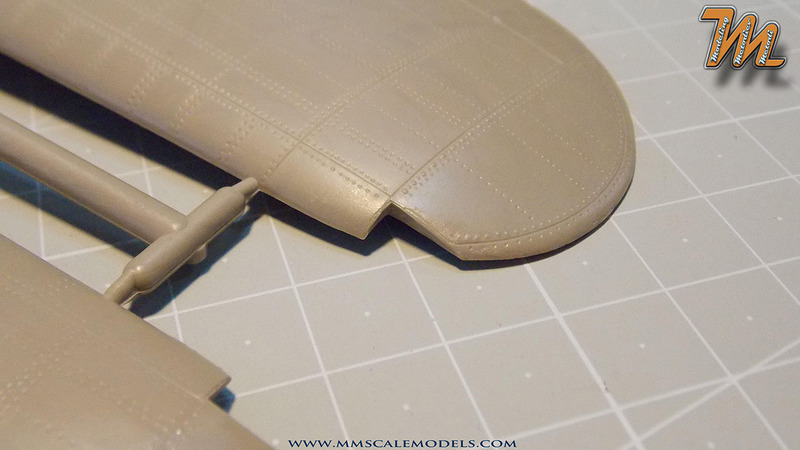 On the leading edge there are openings to accommodate the landing lights, wing tip lights and the guns. 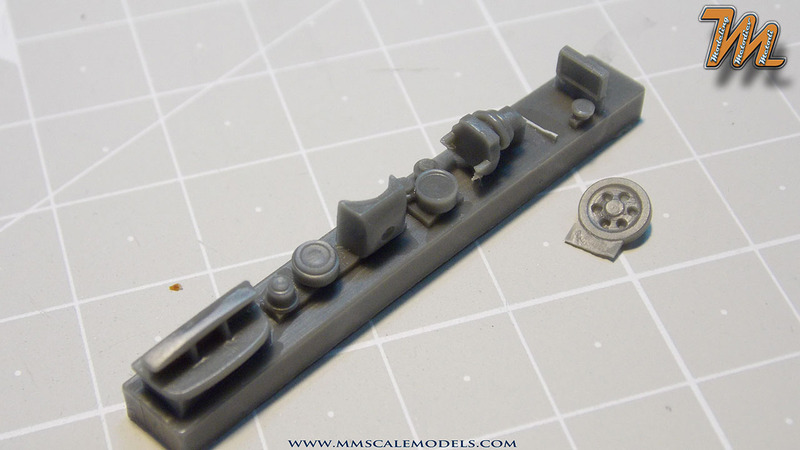 One thing is quite odd though.. the ammo shell ejection ports are blanked off. 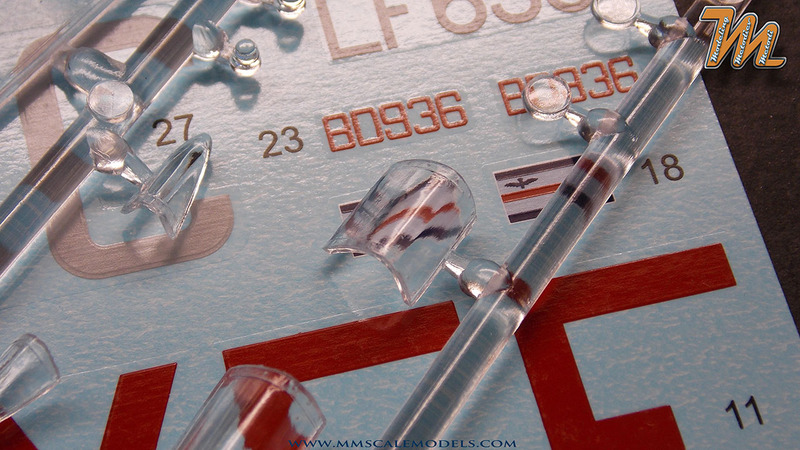 I guess they have to be opened up by the modeller. 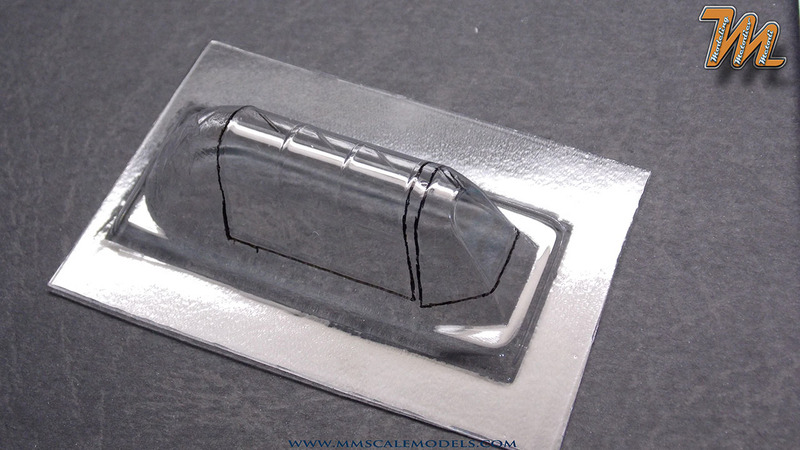 I just wish there was an option to deploy the flaps, but there is not such an option so if you want the deployed prepare for quite a surgery followed by corresponding scratchbuilding effort. 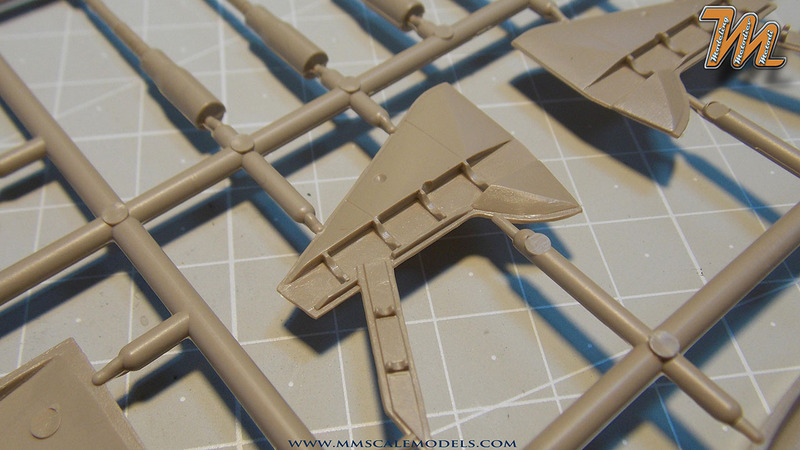 Sprue C holds the lower centroplane, the rudder halves, the elevators halves, two types of spinners, four propeller blades, parts of the cockpit frame assembly, the front bulkhead, the rear gear leg and other misc. items. 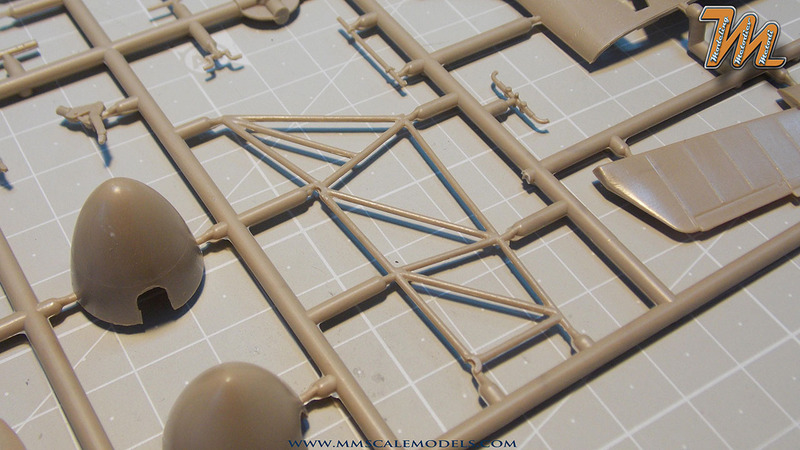 The ribbing structure again looks good. 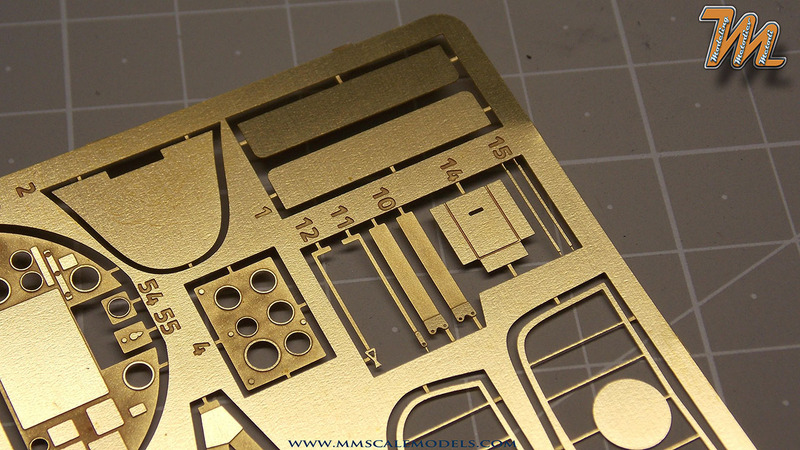 Here we have the option to position the rudder and the elevators as we like. 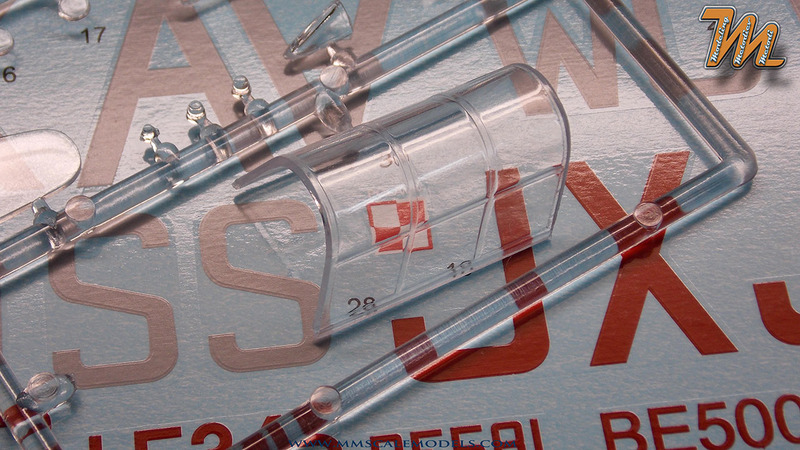 The tubular frames are basic but all the necessary detail is on the PE fret and in resin. 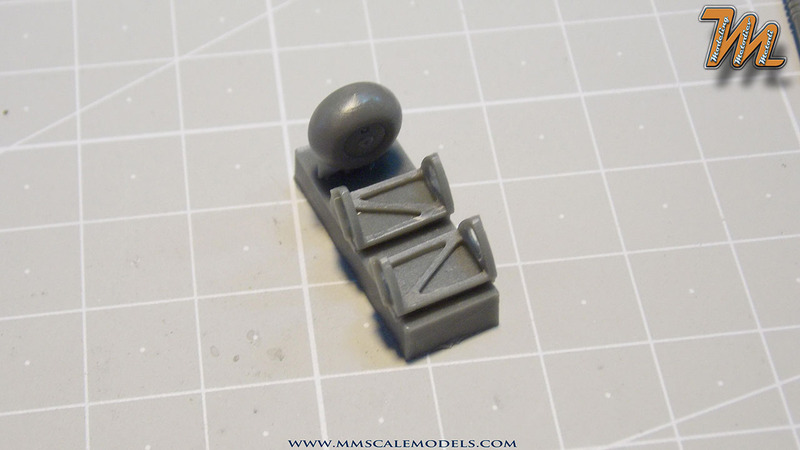 On the rear gear leg there is the same type of plastic blockage, where it supposed to be just... air. This will not be as easy to remove as those on the wings. 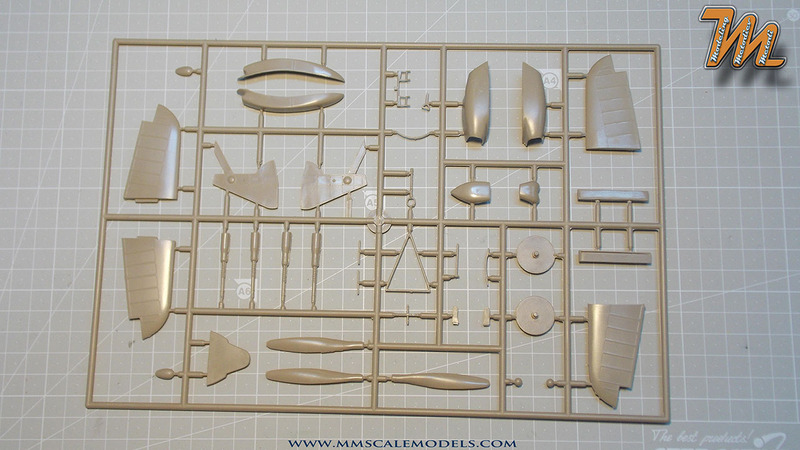 Here you will find the horizontal stabilizers halves, the radiator housing, three types of air intakes, various cockpit parts, four machine guns, propeller hub, wheel well covers, and other misc pieces. 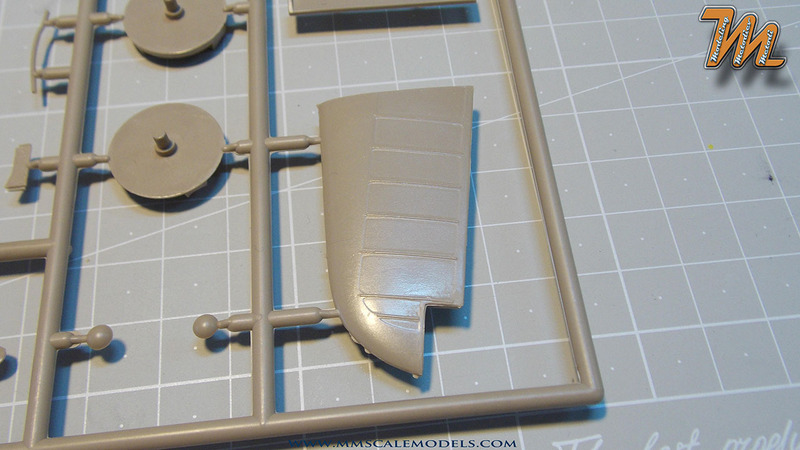 The ribbing detail on the stabilizers looks fine, on the wheel well covers exterior you get raised rivet detail and nicely depicted structure on the inside. 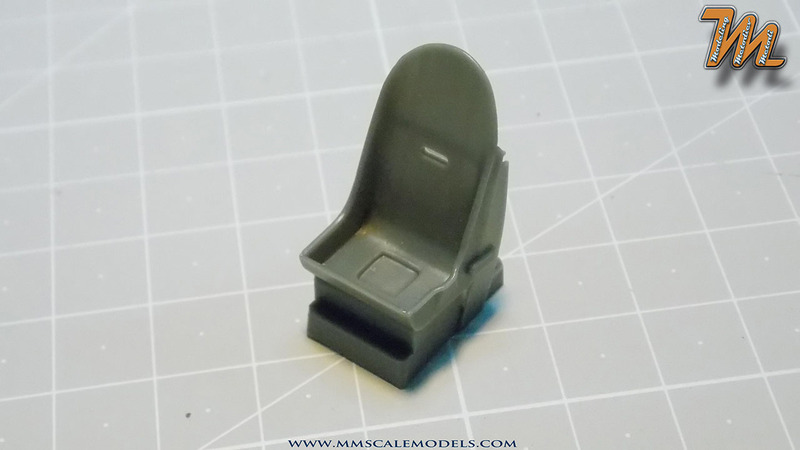 The control column and rudder pedals look OK but perhaps could have been more detailed and in resin (they get some PE too). The air intake that is to be used in this model is not opened up so, again, the modeller have to correct for this (actually you get PE mesh in front so it might not be visible). 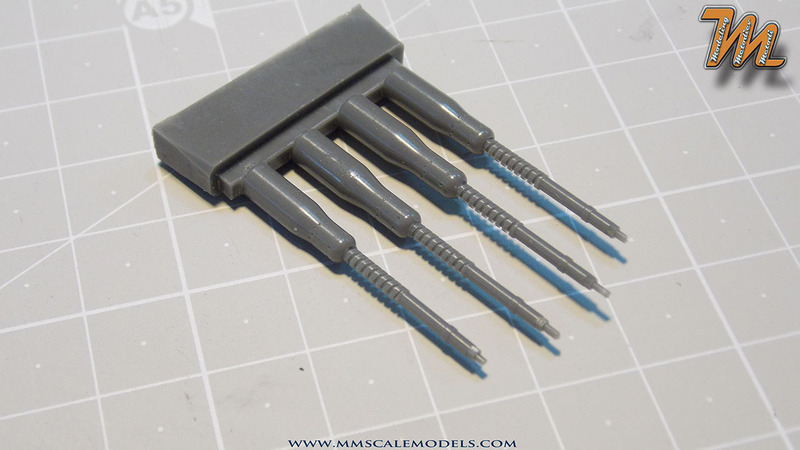 I don't get why you have injection moulded MGs if you have them in resin. 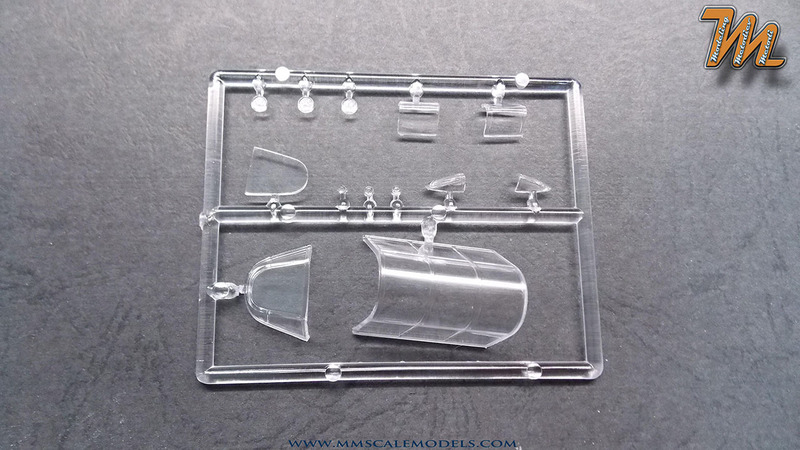 Here you get the canopy and windshield, landing light covers, wing tip light covers, formation lights and their covers and a bullet proof windshield insert which is optional. 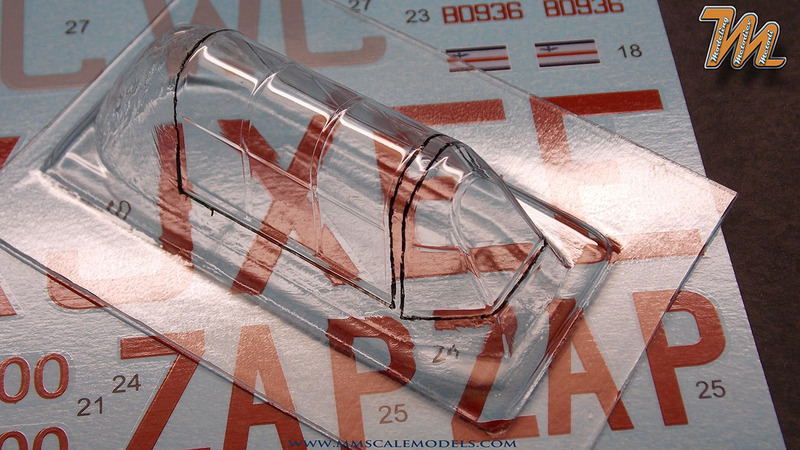 Clarity on the canopy and windshield is excellent and the distortion is minimal. The frames are nicely restrained and crisp. 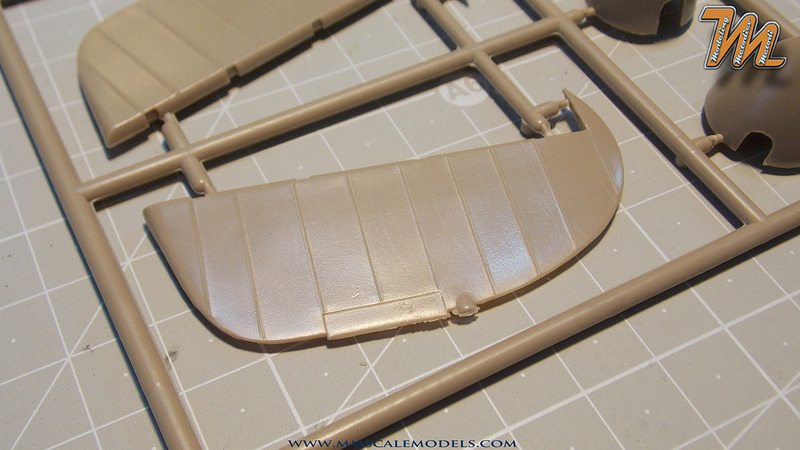 The landing light covers and wing tip light covers have a lot of distortion. 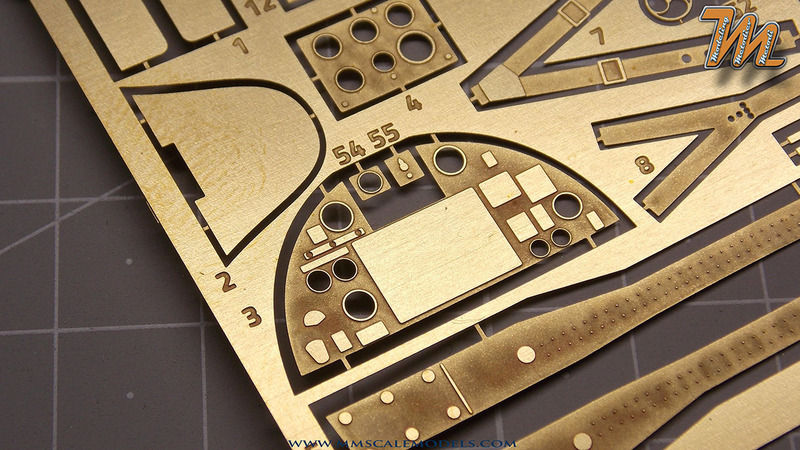 The details on the photoetched fret are designed to compliment mainly the cockpit but also some of the exterior of the scale model. 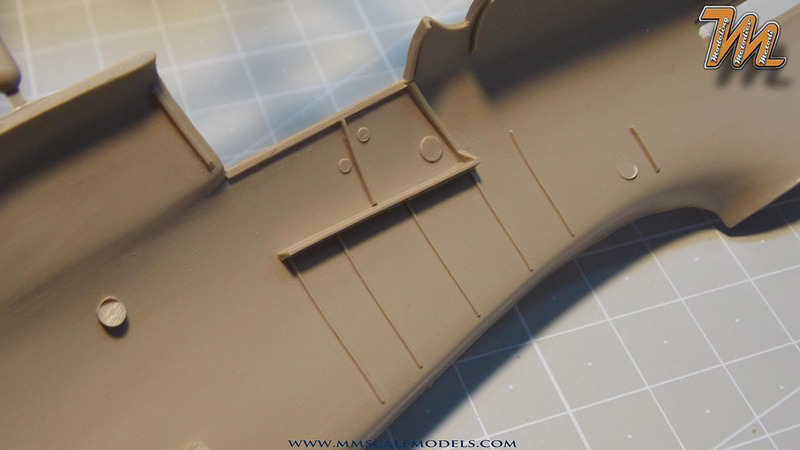 On the small fret there are the meshes for the air intakes and for the radiator. On the big fret there are the seat belts, plates for the cockpit floor, the multi part instrument panel, several levers and handles, the base for the gunsight, a plate for the headrest and so on. 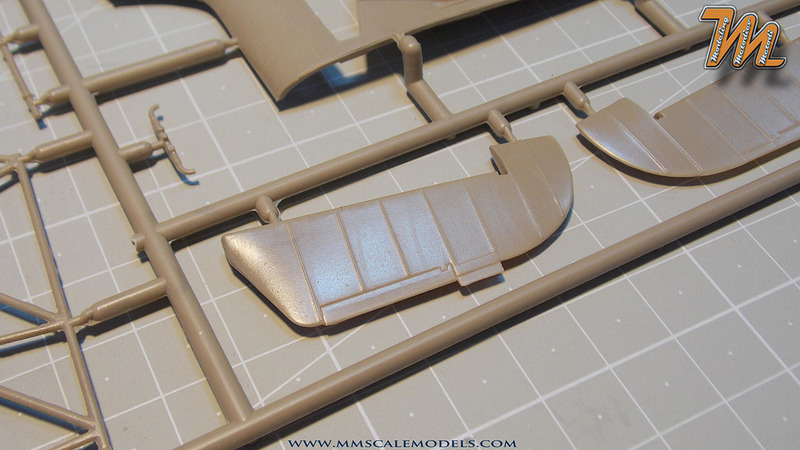 For the exterior there reinforcement plates for the lower wing joins, more details for the intakes and the radiator and other misc items. 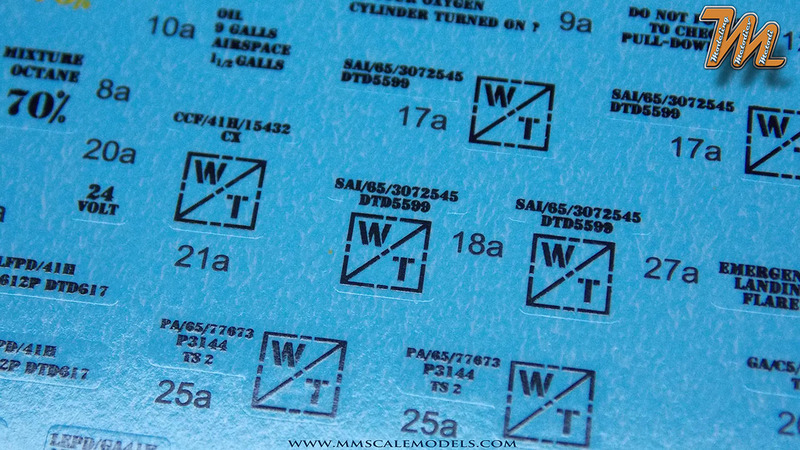 Along with the photo etched Instrument panel you get a nicely printed acetate sheet with the instrument faces. 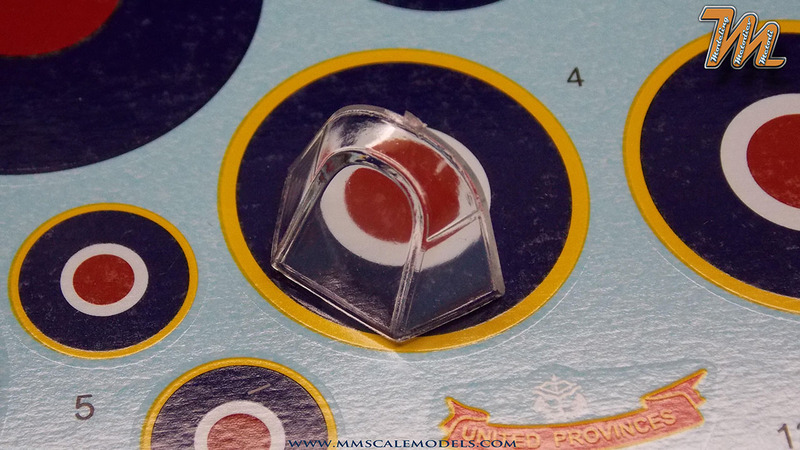 The PE set is made by company called Hauler. 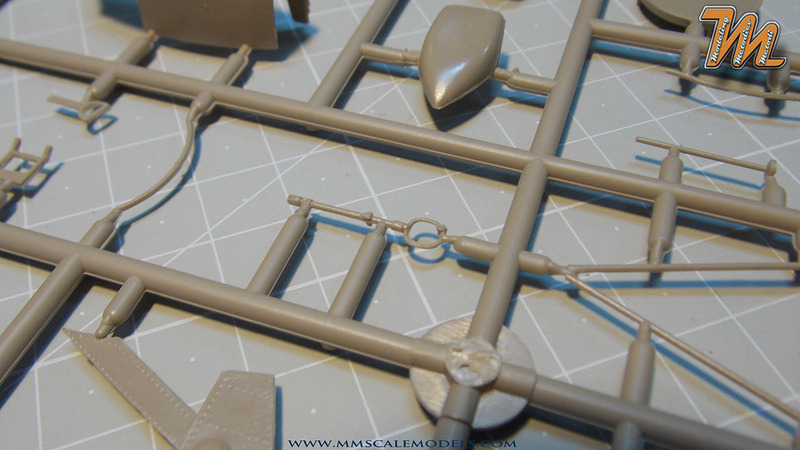 The quality of the set is excellent and will add great detail, especially in the cockpit. 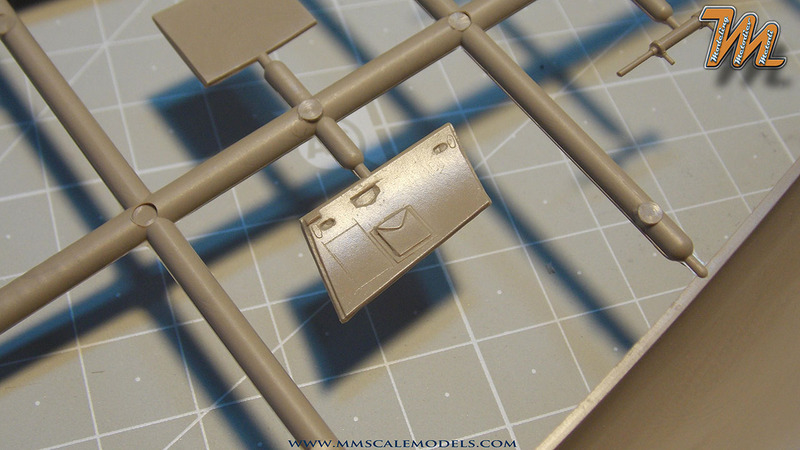 The resin details come from Artillery. There are nine block of parts. 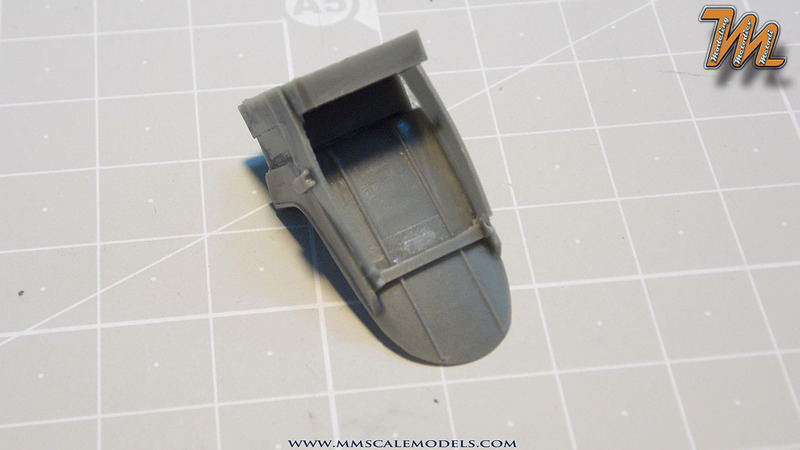 the most prominent of them is the wheel well which is nicely detailed (a few plastic parts to add as well) and casted with just a little to be cleaned up besides the pour block. The tires are also excellently detailed but do not have weighted look which is strange. 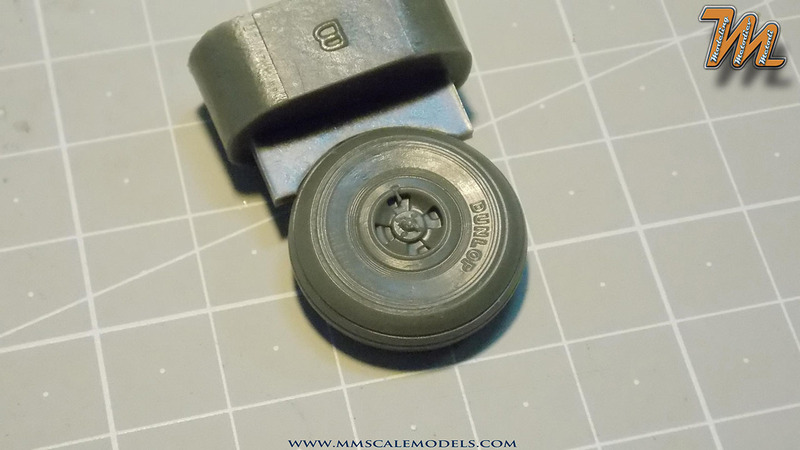 Why make resin tire and don't add that little bit of realism? 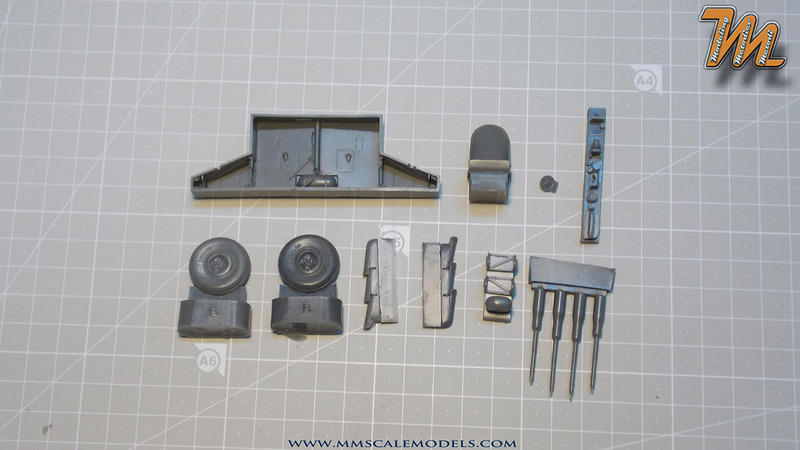 The guns, the pilot seat, the exhaust, the rear wheel, landing lights bases and multiple interior parts also come in resin. 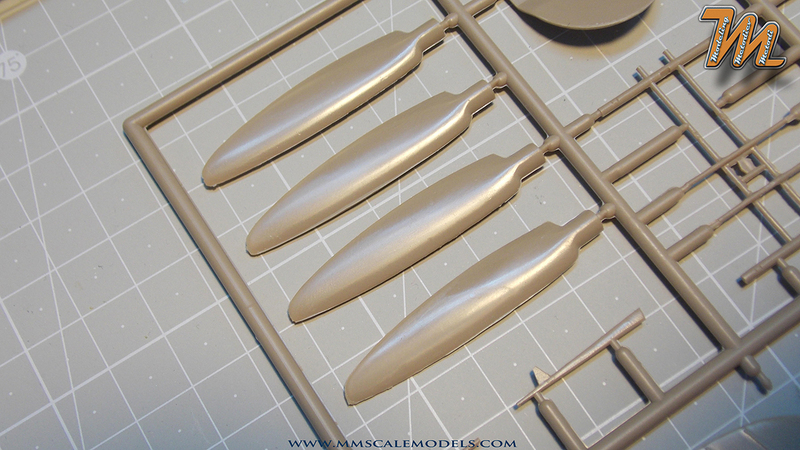 Great package overall, nice casting with little to none defects on the parts, only some flash to be cleaned. 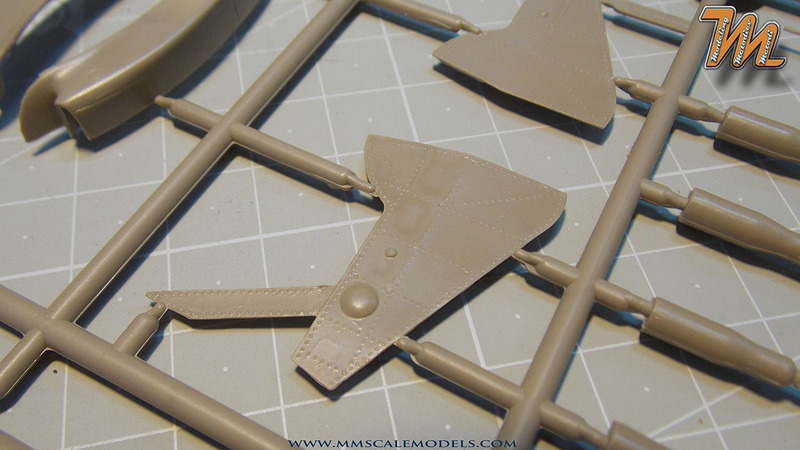 If you want 1/32 scale Hawker Hurricane there is not much choice. 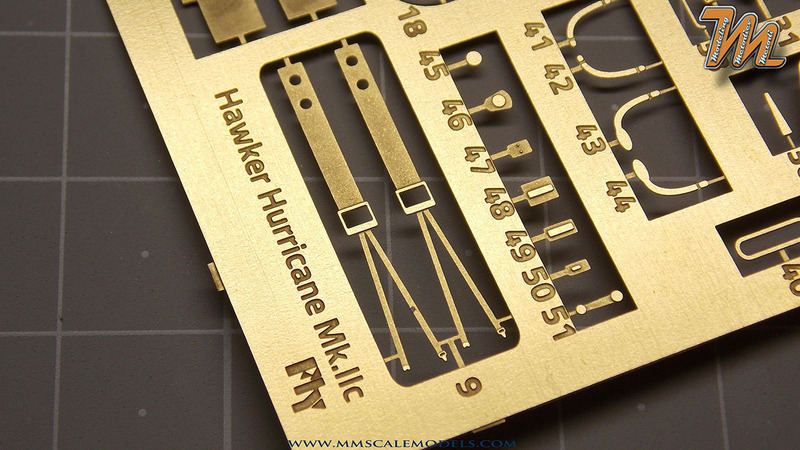 With the release of Fly models Hurricane line up we get modern kit to fill that gap. 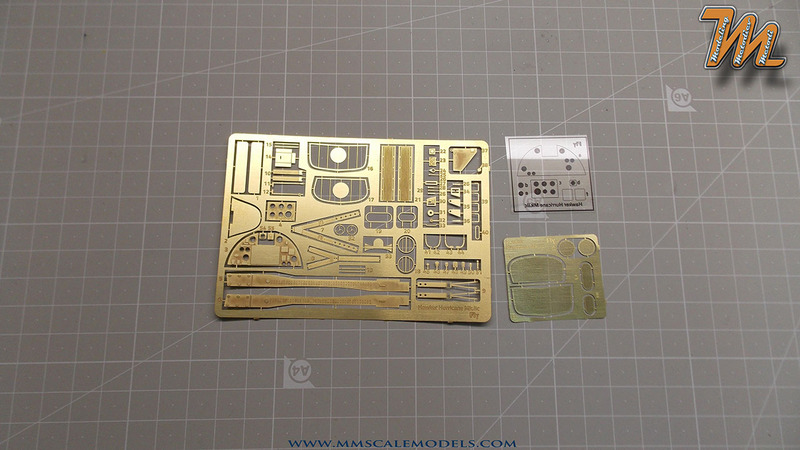 If you are not afraid of limited run kits ( or photoetched parts; or resin parts) you should consider this kit. Yes, there are several things that I don't like... no engine, no flaps, but there is a ton of resin, PE and very nicely detailed plastic. 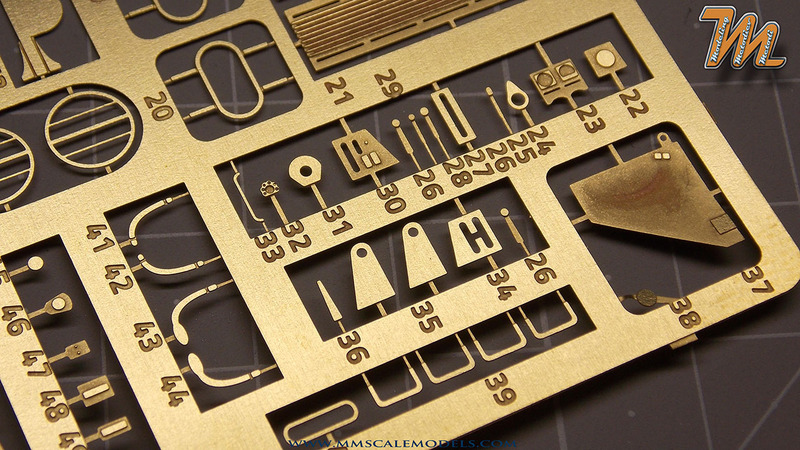 For those who are going to get this kit - explore your instructions. This is clearly not "shake and bake" type of kit that builds itself. 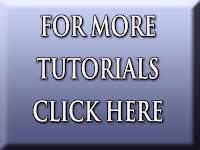 Therefore I recommend it to those who are not going to be put off by some extra work. 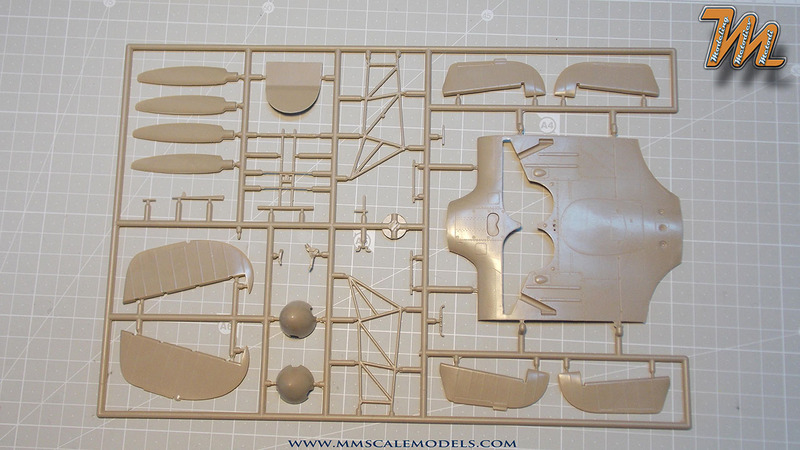 I am sure that there will be plenty of great scale models of the Hawker Hurricane built from it. 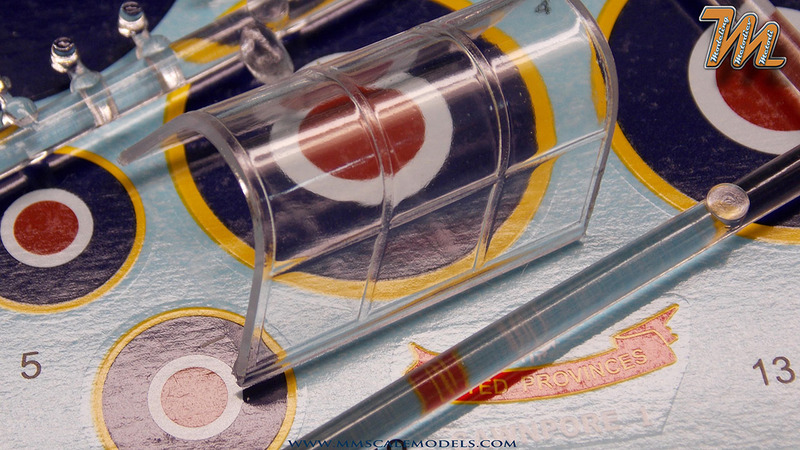 Fly models offer a few additional things that complement this Hawker Hurricane scale model kit. 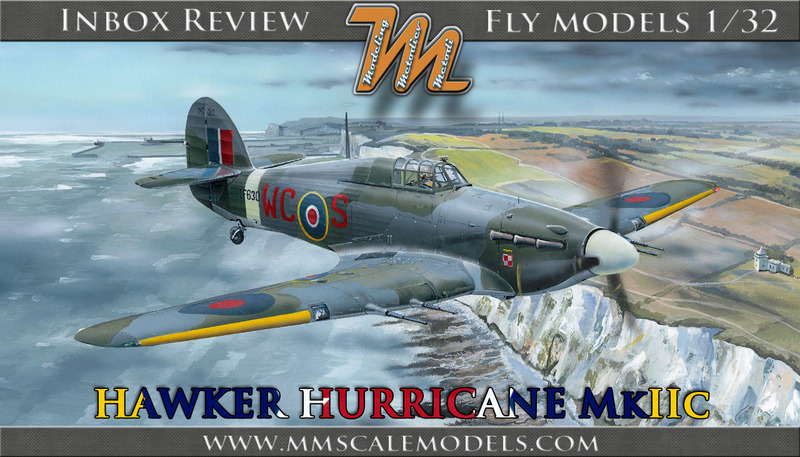 This concludes my review of Fly models Howker Hurricane MkIIc kit No:32012. I hope that you like it and that it will serve its purpose as product review. 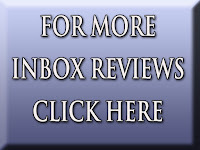 This inbox review comes to You with the support of FLY models.